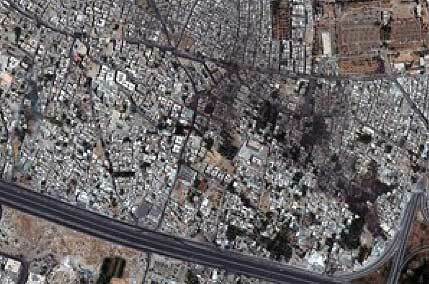 Qabun, Damascus, Syria-July 18, 2012: This is a satellite image of the Qabun neighborhood in Damascus, Syria where violence has been reported over the last 24 hours. Satellite imagery shows military vehicles on 6th Rishreen road in the lower left portion of the image, as well as a smoking building on the feeder road in the center of the image. Vehicle tracks and possible rubble are visible just above the smoking building. Providing a virtual presence is what DigitalGlobe does best, by rapidly delivering shareable, high-resolution imagery of places affected by natural disasters to aid first responders and personnel on the ground.